"A female human rights lawyer in the northern city of Mosul was executed by firing squad at the orders of Islamic State extremists, activists said Thursday, sparking international outrage. But she was not the first to suffer such a fate in a city where the militants' rule is increasingly oppressive - especially for women. Samira al-Nuaimy, known locally for her pro bono legal and humanitarian work, was executed last week, according to rights activists and residents. The United Nations said that she was killed in a public square and that her body showed signs of torture when it was returned to her family. Since seizing control of the Iraqi city in June, the Islamic State has expelled religious minorities and steadily stepped up its oppression of those who remain. New rules ban women from working in jobs other than health care and education, where they are deemed necessary to treat and teach other females. A regulation requiring all women to fully veil their faces was initially unenforced. But now, breaking that rule can trigger heavy penalties, including beatings. Women such as Nuaimy, who refuse to submit to the militants, risk losing their lives. 'Samira was not the first,' said Suha Oda, a 29-year-old social activist from Mosul who has moved to the Kurdish-administered area nearby but monitors human rights issues in the city. Four women have suffered a similar fate over the past month, she said, including three doctors who were executed last week. Iraqi media reports said the women had been killed because they refused to treat a wounded Islamic State fighter." "Le terrorisme sioniste" - The Zionist Terrorism - was a theme of an event held at the UN in Geneva on September 22, 2014. A slide bearing this title was part of a presentation given by Ayssar Midani (pictured right), at "an informal meeting held in parallel to the session" of the UN Human Rights Council. The meeting, entitled "State terrorism: The case of Gaza," was organized by the UN-accredited NGO "The Union of Arab Jurists". Though the UN bulletin announcing the event carries a standard disclaimer for what may or may not be said, the application to hold the meeting in the first place must have been vetted and approved by UN staff. In addition, the UN itself, advertises the event widely to government and non-governmental organizations. 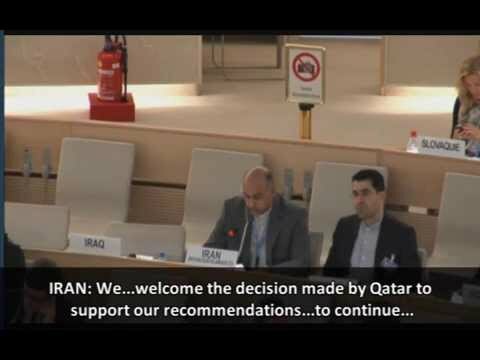 And just who is this Ayssar Midani who was handed a UN microphone alongside the "Human Rights" Council? A Syrian apologist for mass murderer President Bashar al-Assad. On August 27, 2013 she gave an interview on the "Syrian Chemical Weapons Hoax" in which she claimed that the Syrian government "will never ever use chemical weapons in Syria" and, furthermore, the uprising against Assad was an American and Israeli plot. A banner encouraging the pursuit of Israeli "war criminals" was displayed at the Palais des Nations in Geneva, Switzerland on September 22, 2014. The occasion was "an informal meeting held in parallel to the session" of the UN Human Rights Council. The meeting was entitled "Human rights violations in the Gaza strip during the Israeli military operation 'Protective edge' and measures to pursue war criminals." It was organized by the so-called "national human rights institution," the Palestine Independent Commission for Human Rights (ICHR). Though the UN bulletin announcing the event carries a standard disclaimer for what may or may not be said, the application to hold the meeting in the first place must have been vetted and approved by UN staff. In addition, the UN itself advertises the event widely to government and non-governmental organizations. Rania Madi, UN-NGO BADIL defended Hamas & the "Palestinian resistance"
On just one day, the UN in Geneva housed three events to paint Israel as a demonic child-killing terrorist entity. The three "informal meetings held in parallel to the session" of the UN Human Rights Council took place on September 22, 2014. They were all timed to maximize the participation of governmental and non-governmental representatives. Permission for all such events must be given by the UN secretariat, and the events are broadly advertised by the UN itself. Though the UN bulletin announcing the events carries a standard disclaimer for what may or may not be said, the application to hold the meeting in the first place must have been vetted and approved by UN staff. The events featured speakers alleging Israel was guilty of crimes against humanity, "extermination" of Palestinians and was a terrorist entity that had no right of self-defense, period. The first side-event, entitled "Palestine: Justice at the ICC to hold Israel to account," was organized by the UN-accredited NGO called "Resource for Palestinian residency and refugee rights" (BADIL). The speakers accused Israel of deliberately "targeting" civilians and hospitals, and referred to the terrorist organization Hamas as a "political party" which "engage[d] in civilian governance." ...Israel is targeting civilians and they even target civilian structures like mosques, schools, commercial centers, hospitals...Israelis justify this by saying that in the civilian structures attacked there were members belonging to certain political parties with armed branches, ignoring the fact that such groups engage in civilian governance..."
The second side-event was entitled "Human rights violations in the Gaza strip during the Israeli military operation 'Protective edge' and measures to pursue war criminals." It was organized a UN-designated "national human rights institution" called the Palestine Independent Commission for Human Rights (ICHR). The speakers accused Israel of every conceivable crime and repeatedly called for Israelis to be tried as "war criminals." Mamdouh Aker, Commissioner and Member of the Executive Board of ICHR: "Israel used certain weapons like time explosives which inflict widespread injuries to civilians...Can we betray victims of these war crimes and crimes against humanity?...Israelis are trying to distort international law...One example is the self-defense argument. They are not entitled to claim self-defense ...Another argument they use is that Palestinians use human shields. In one aspect this dehumanizes us as Palestinians. I just refer to the marvelous letter by Sarah Roy whose parents were survivors of the Holocaust addressed to Eli Wiesel a very Zionist American who said we have no respect for human life and put our children as human shields. And she said, I as a Jew coming from a family of Holocaust survivors am ashamed that someone like Wiesel would use this argument of dehumanization of Palestinians ...We have to bring Israelis to the ICC and try them as war criminals... My colleague will give you an idea of some of the atrocities and violations the Israeli army committed in the last war." Aisha Ahmed, ICHR member: "The Israeli military forces targeted civilians...killed more than 2,000 Palestinians of whom the majority were women and children...Occupying power committed murders...They have been targeting entire families...Targeting women and children...Using chemical weapons is a serious violation under the Geneva Convention which bans all measures that would cause physical suffering or extermination...Individual mass forced transfers as well as deportations of persons are prohibited regardless of their motive...The occupying force targeted civilian objects from schools, mosques, and charities...The bombing of the only power station in Gaza is a war crime". Hassan Bin Thalet, Secretary-General of International Association International Gulf Organization: "Palestinian people are exposed to all kinds of violations, terrorism...The Palestinian case...represents people denied of their rights, exposed to violations, crimes against humanity, war crimes, and genocide at the hand of the Israeli occupation forces...We must exert efforts... to prosecute war criminals, those who have committed serious violations against the Palestinian people in international and regional criminal courts." "Jabotinsky was a principal ideologist of the lead terrorist clandestine organization Irgun, the first terrorist organization in the Middle East...Two Jewish terrorist organizations which started in the last century, Haganah and Irgun, organized assassinations in the entire Middle East, against the Palestinians etcetera ...The massacres perpetrated by the terrorist organizations Irgun and Hagana - which subsequently formed the IDF [Israel Defense Forces] continued at a systematic pace against the Palestinian people, aimed at emptying the land of its inhabitants: Haifa, Jaffa, Jerusalem, Gaza, Sabra and Shatilla, Rafah, Jenin. .."
The UN Human Rights Council has a permanent agenda of ten items, one reserved for condemning Israel alone, and another for considering (if they feel like it) some of the other 192 UN members. On September 22, 2014, the permanent anti-Israel item - "Human rights situation in Palestine and other occupied Arab territories" - was front and center, once again. Although UN staff is fond of blaming states for all the UN's ills, the day served as a reminder of the major role played by UN officials themselves in the demonization of Israel. Flavia Pansieri, Deputy High Commissioner for Human Rights, implied that Israel was somehow to be blamed for the deaths of Palestinians who drowned in the Mediterranean after human smugglers deliberately rammed their boat several days ago: "Gazans found themselves in an intolerable situation, trapped in the densely populated strip under blockade...The tragic deaths of hundreds of migrants from Gaza in the Mediterranean in recent days show just how desperate many people are to escape their miserable situation." The traffickers took advantage of people from a number of places including Syria, Egypt, Sudan and Gaza, and then deliberately sunk the boat killing almost all on board. The reason for Palestinians wanting to leave Gaza, where they are used as human shields by Hamas as part of its campaign to destroy Israel, was somehow omitted from the UN's comments. The Palestinian Ambassador accused Israel of "all forms of maiming and murder" while declaring that "Israel is the biggest violator of human rights." Syria, where over 200,000 citizens have been killed by its government, said "settlements are war crimes" and "amongst crimes seen lately is bloodletting in Gaza." Pakistan for the Organization of Islamic Cooperation (OIC) compared Israel to apartheid South Africa: "we condemn in the strongest terms apartheid policies that Israel operated in the opt in terms of racially segregated roads...and the fragmentation of territory and enclosure of Palestinians in bantustans like areas." Venezuela accused Israel of "war crimes and crimes against humanity...aimed at exterminating Palestinian people" and "genocidal aggression." Cuba said Israel's aim was "annihilation" of the Palestinians and accused it of "genocidal practices." Saudi Arabia accused Israel of "detentions and rounding up and many victims killed in the Occupied Palestinian Territory." Qatar said Israel used "self-defense only as a pretext" to continue its "savage practices against the Palestinian people." The Maldives and Oman accused Israel of "crimes against humanity," while Bangladesh accused Israel of "ethnic cleansing goals." Genocidal Iran - which openly calls for the eradication of Israel - said "Israeli policies amount to apartheid" and "constitute genocide and crimes against humanity." Left: Death notice of PIJ senior commander Mahmoud Awad Ali Ziadeh. Right: Mahmoud Awad Ali Ziadeh (Abu Awad), battalion commander in the PIJ’s northern Gaza Strip brigade. 1. This information bulletin is the fifth in a series of publications of the Intelligence and Terrorism Information Center (ITIC), as part of a project examining the names of the Palestinians killed in Operation Protective Edge. The project's goal is to determine which of the fatalities are terrorist operatives and which are non-involved citizens, and to examine the ratio between them. The findings of our investigation so far (based on approximately 40% of the names of the dead) suggest that terrorist operatives constitute about 49% of the fatalities who have been identified, while non-involved civilians constitute approximately 51%. This ratio may change as we continue our examination. 2. The number of names of those killed, examined by the ITIC to date, is around 750, i.e., about 35% of the number of Palestinians killed to date (a total of 2157, according to a report by the Palestinian Ministry of Health issued on September 14, 2014). The examinations carried out by the ITIC are based on the names of the dead that appear on the Palestinian Health Ministry's lists, despite the reliability problems and deficiencies found in them. From the lists examined we have removed duplicate names and added the names of terrorist operatives, who do not appear on them (both for technical reasons and as a result Hamas's policy of concealment and deception). Therefore, the number of fatalities examined by the ITIC to date is 842 (i.e., approximately 39% of the total number of fatalities). A. 354 of those killed were terrorist operatives. B. 367 of those killed were non-involved civilians. C. 121 people who were killed are unidentified at this stage. Therefore, it is not possible to determine whether they were terrorist operatives or non-involved civilians. 4. Of the 721 dead who could be identified, terrorist operatives constitute approximately 49% of the names. Non-involved civilians constitute approximately 51%. This ratio may vary as the ITIC continues to examine additional names of those killed.